This release is another “newie” to The Ancient One and would probably have remained under my aural radar if it hadn’t landed on my desk for review. 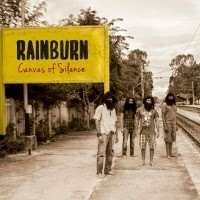 The band is Rainburn and the release is a 5 track EP entitled Canvas Of Silence. Rainburn is an Indian progressive band, formed towards the end of 2011 and then having got together, they spent time rehearsing until into 2012 when they started doing live appearances. Initially the band did cover versions of material originally recorded by Rush, Alice In Chains and Porcupine Tree, and also recorded and released 2 demo tracks, but a few changes in personnel led to a subsequent change in sound. The original keyboards disappeared to be replaced by a second guitarist filling the gap. Rainburn is a 4 piece outfit, comprising, Vats Iyengar (vocals, guitar), Toshimoa Jamir (guitar), Shishir Gupta (bass) and Praveen Kumar (drums), with the resulting change in the sound drawing comparisons more in the areas of Dream Theater, Megadeth and Stevie Vai. The opening track on Canvas of Silence is “Refuge” (5:23) and enters with the sound of a rainstorm, leading into some excellent guitar work followed by the very tight rhythm engine. The track seems to move between the more “dreampop” and “heavy prog” genres which appears to be a characteristic of the band. Gentle melodic passages with a powerful vocalist, lead almost unsuspectingly into the heavier areas and then move back again. This opening track allows the band members the chance to “show their wares” and is an excellent starting point for this release. The title track, “Canvas of Silence” (5:38) follows and is a step away from the “dreaminess” of the opener with more aggressive bass and guitars and a deeper throaty sound to the vocals. This is a more varied track vocally and the excellent Vats Iyengar gets to demonstrate his versatile range. The track has some superb little hooks and continues the feeling of satisfaction the listener picked up from the opening track. “Veil” (6:11), track three, starts with a slower tempo and a very distinct Eastern sound, before some blistering guitar ushers the vocals into the mix. The highlight of this track is the almost hypnotic rhythms that permeate its length. There is more of the blistering guitar appears from time to time but the melodic overview of the track is never far away. If anything, the vocal is the least impressive on this track as at times the voice seems to be straining, beyond what is necessary. The penultimate track, “Time Turns Around” (2:59) is the shortest, and the most gentle, melodic song on offer, and shows another side of the band. Perhaps it is the shortness of the track, but the evolution from melodic to heavy never appears and it makes the song interesting in a different way. The final, and longest track, “Fragments” (7:44) enters with some terrific guitar riffs as the guitars play off against each other, one is choppy and heavy and the other strummed and melodic. Crystal clear vocals drive this song, riding high above the dual guitars, as they veer in and out, drawing the listener deeper into the song. The title sums the track up, as the tempo and drive shift so many times, but the fragments merge together expertly and at no time does it feel in any way disjointed. This is a terrific finale to this 5 track release. Over the 28 minutes or so of Canvas of Silence, Rainburn successfully demonstrate that they are a band who will achieve many things. The lasting feeling once the mini album has finished is that here we have a band that is taking the first steps on a road that leads upwards into the higher levels of prog music. I have no qualms about placing both stickers “One to Buy” and “The Experience will last Forever” on the cover and suggest that if you like progressive music that shows a little freshness, look no further than Canvas of Silence by Rainburn. I am looking forward to seeing (or should I say, hearing) where Rainburn go from here.